What is Pressure governor ? A discharge-pressure operated governor (Figure 1) and a rising head/capacity curve from full load to no load gives inherent stability of operation. The main feature of the governor is that if the pump loses suction the steam ports are opened wide, allowing the pump to accelerate rapidly to the speed at which the emergency trip acts. An adjusting screw, the collar of which bears against a platform in the casing, is threaded into the upper spring carrier and allows the compression of the spring to be altered by varying the distance between the upper and lower spring carriers. The piston, fitted with an O-ring and a spiral back-up ring, slides in a close fitting liner. A flange on this liner locates in a recess in the governor casing cover and is sealed by an Armco iron joint ring. When the pump is started, the throttle valve moves upwards due to the increasing discharge pressure under the piston until the desired pressure is reached. 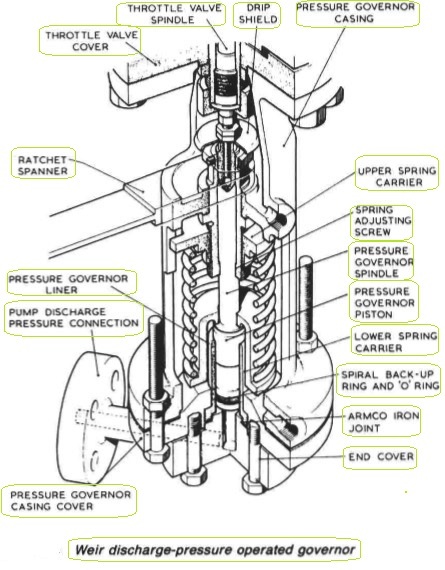 At this point, the upward force exerted on the governor spindle by the piston is equal to that being applied downwards by the spring, and the throttle valve is admitting the correct quantity of steam to the turbine to maintain the desired discharge pressure. With an increased demand on the pump the discharge pressure falls, allowing the pressure governor piston to move down under compulsion of the spring until the throttle valve opens to provide steam to satisfy the new demand. The reverse action takes place when the demand decreases. 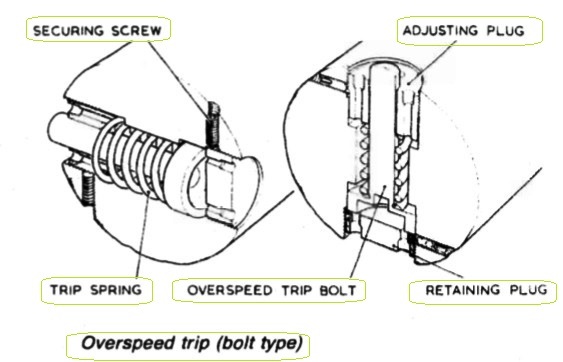 The 'Bolt' type overspeed trip (Figure 2) consists essentially of a spring-loaded stainless steel bolt which, due to its special design, is heavier at one end than the other. The rotary motion of the turbine shaft tends to move the bolt outwards, while the spring retains it in its normal position until the turbine speed reaches a pre-determined safety level. At this speed the centrifugal force exerted by the heavier end of the bolt overcomes the spring opposing it and the bolt moves outwards to strike the trip trigger. This in turn disengages the trip gear, allowing the steam stop valve to shut. Prior to the introduction of the water lubricated turbo-feed pumps an oil-lubricated pump with a relatively long horizontal shaft was commonly used. 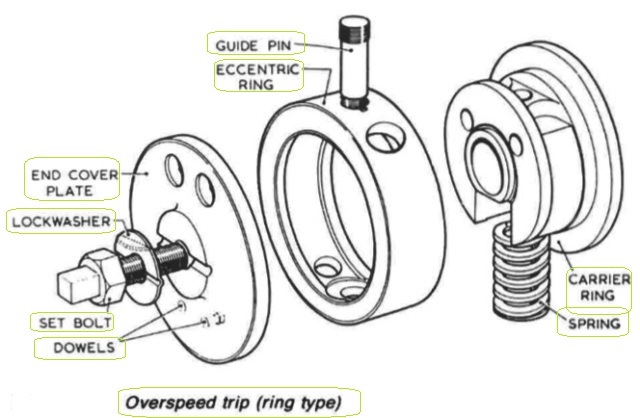 In this particular pump the overspeed trip (Figure 3) was of the ring type. The pump was mounted on a taper at the end of the turbine shaft adjacent to the trip gear and was secured by a mild steel set bolt tapped into the end of the shaft. This set bolt was locked in place by a copper lock washer. The overspeed mechanism consisted of a case-hardened steel ring which, bored eccentrically, was weighted off-centre. The ring, however was spring loaded to maintain concentricity with the shaft until the speed of the turbine reached a predetermined safety limit. At that speed the centrifugal force exerted by the ring would overcome the force of the opposing spring and would then move outwards to strike the trip trigger. To control the axial movement of the rotating assembly, a balance piston (Figure 4) is arranged to counteract the effect of the thrust of the turbine and impellers. The arrangement keeps the rotating assembly in its correct position under all conditions of loading. 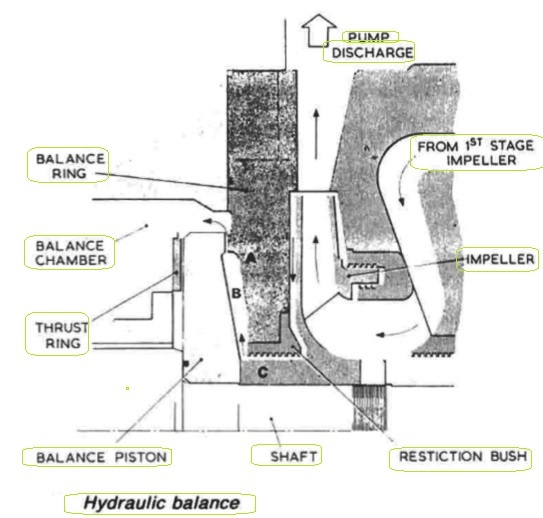 Water at the approximate pressure of the pump discharge passes from the last stage of the pump between the impeller hub and the balance restriction bush C into the annular space B dropping in pressure as it does so. The pressure of water in the chamber B tends to push the balance piston towards the turbine end. When the thrust on the balance piston overcomes the turbine and the impeller thrust, the gap A between the piston and balance ring widens and allows water to escape. This in turn has the effect of lowering the pressure in chamber B allowing the rotating assembly to move back towards the pump end. Theoretically this cycle will be repeated with a smaller movement each time until the thrust on the balance piston exactly balances the other axial forces acting on the assembly. In practice the balancing of the forces is almost instantaneous and any axial movement of the shaft is negligible.